If you would ask me if Darmstadt is a nice city without thinking I would rather say no. But actually it is. There are quite a few beautiful spots and I guess it must have been outragiously beautiful before the 11th of September 1944, when an air raid caused a fire storm that destroyed three quarters of Darmstadt. What was destroyed was rebuild in the ugliest forms of post war architecture you can imagine, which, at first sight, can make Darmstadt really ugly. But of course I’m only showing you the nice parts. Starting right in the city center there is the Luisenplatz. This otherwise not really nice place is the main changing station for all busses and trams in Darmstadt and home to the “Langer Lui”, long Ludwig. 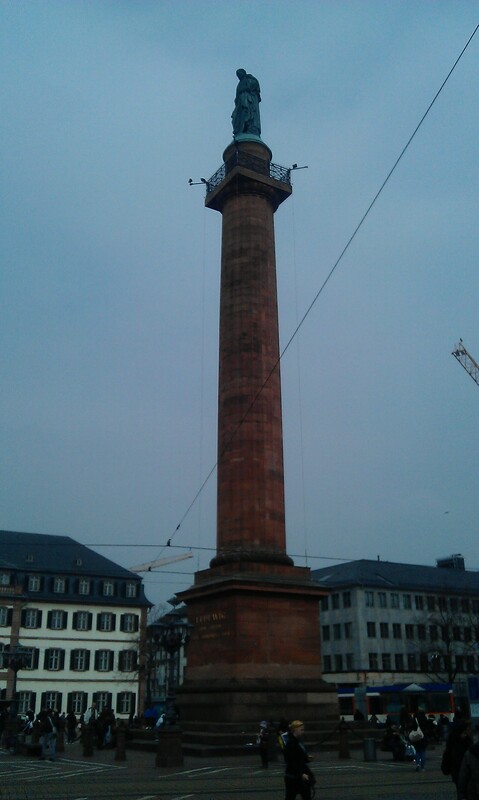 It is the statue of Grand Duke Ludwig, build in 1844. You can climb up the tower on certain days to have a look above Darmstadt. Here you are at the border of Darmstadt’s shopping area that is ugly but quite let’s say effective. You get what you need. On the other side of the Luisenplatz, facing the old market square with the old town hall, where you find Darmstadt’s christmas market in Winter, is Darmstadt’s palace. Burned down during the firestorm of 1944 it was rebuilt and now houses a police station ,the university library, a very cute old museum on courtly life in the palace and a student night club, the “Studentenkeller” worth while a visit for a party if you are into student parties. Close you’ll also find the “Weiße Turm”, a general meeting point when meeting friends here and once part of Darmstadt’s fortification and the Stadtkirche, Darmstadt’s main church which houses the graves of the old dukes of Darmstadt. 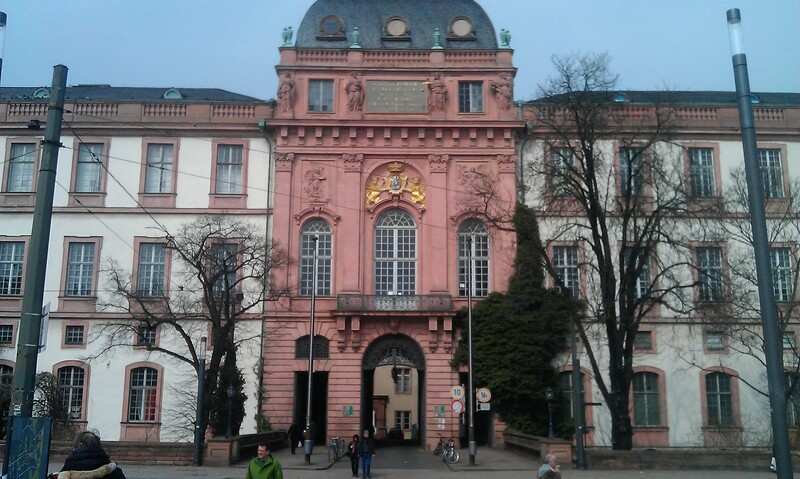 If you walk through the palace you end up in front of the Hessisches Landesmuseum, a multidisciplinary museum, undergoing renovation at the moment. Renovation should be finsihed by end of 2013. The you can find natural history artefacts along side of pieces of Joseph Beuys. His famous fat chair is here too. Let’s see if with the renovation they have figured out a way to get rid of the stink the rotting fat leaves… Just right of the museum is the old theater that now houses the Hessian State Archives. It borders with some parts of Darmstadt’s famous technical university and behind with the Herrengarten, one of Darmstadt’s many parks. On the right is the new exhibition center Darmstadtium, named like the found element that was named after Darmstadt. The Darmstadtium was build around the old city walls of Darmstadt that run here. 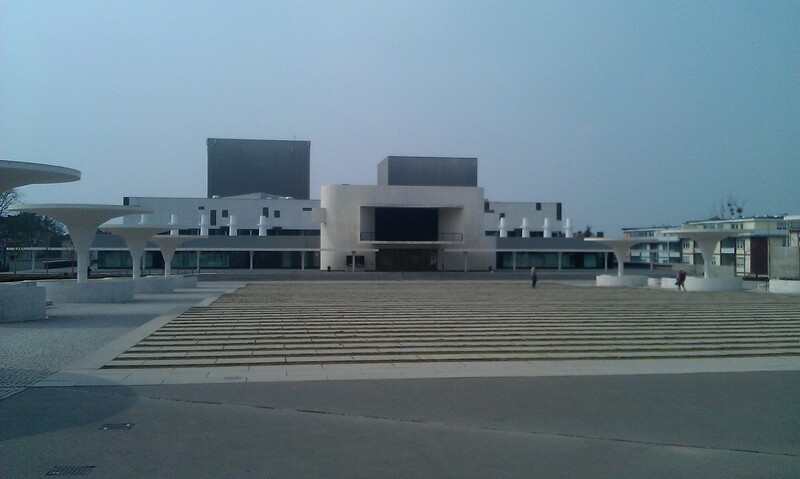 To be honest I’ve never been inside because it was only build when I not longer lived in Darmstadt. 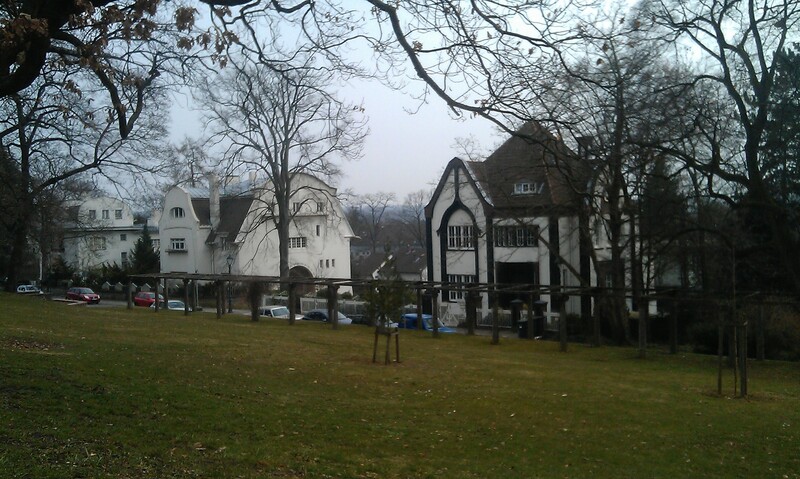 From here you can walk up hill to the Mathildenhöhe. Here you find not only Darmstadt’s signature building (see first picture), the Wedding Tower or also called Five Finger Tower but also a Russian Orthodox Chapel. 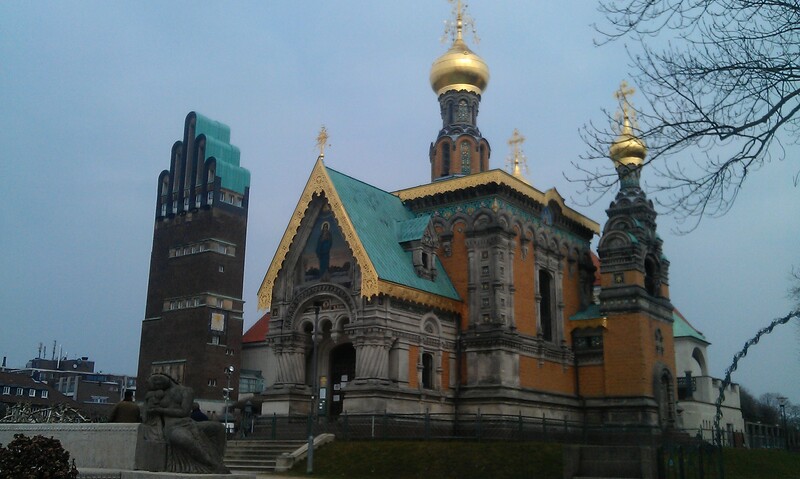 Now you would ask: what is a Russion Orthodox Chapel doing in Darmstadt? Well the tsar, Nikolas II (yes, that’s the one who got killed along with all the other family members during the Russion Revolution), ordered it because his wife, the tsarina Alexandra, was born as Alix of Hesse (there is a great biography about her, called Alexandra – The Last Tsarina by Carolly Erickson), a granddaughter of Queen Victoria and sister of the last Grand Duke of Hesse-Darmstadt, Ernst Ludwig. Tsar Nikolaus II wanted a place to pray here when they came to visit her family. But the Mathildenhöhe is far more famous for its artists’ colony founded by Ernst Ludwig. Here you have many beautiful Art Nouveau Buildings. Some are especially planned to be exhibition centers. Others were their architects homes and are now mostly inhabited by their new owners. From here you can also walk to the Rosenhöhe, another huge park with a beautiful English style rose garden. But it was too cold and the sun had gone again, so I decided not to walk there anymore (also due to the fact that I was wearing my comfy but very high heeled shoes that I bought in London). Maybe I can do a tour through Darmstadt parks to show them to you when I come back later this year because Darmstadt has beautiful parks. This entry was posted in Germany and tagged Art Nouveau, Darmstadt, Hessen, History, Jugendstil, Park by kathatravelling. Bookmark the permalink. I found Darmstadt to be a most beautiful and welcoming city, as well as picturesque. I fell in love w/Herrngarten. I enjoyed shopping in and around Luisenplatz. I also found a beautiful park on the other side of town w/a beautiful collection of decorative flowers and plants and, also, a beautiful fountain. Near Moosebergstrasse, I discovered a lovely English-style garden of some of the most beautifully planned flowers, along w/what I believe was an opera house,or some type of performing center. I took side trips to Seeheim and Eberstadt. I found the streetcars to be comfortable and efficient. I visited the Schlosskeller and picked up up fresh vegetables in a street market. I fell in love w/Darmstadt. I stayed at a comfortable, reasonably-priced hotel near Luisenplatz and, after two weeks, I took the train to Mainz. I would recommend Darmstadt to any traveler. My next trip will be the Romantischestrasse, Holiday in Hessen, I wish to visit Michelstadt, Rothenberg, and to travel down the river, to see the castles and the Lorelei. Das erste Foto vom Hochzeitsturm…, eine Fotomontage?! Wenn ich mir Fotos von diesem Turm ansehe, sehen die umliegenden Gebäude schmuckloser aus. Diese Kirche (?) mit den goldenen Zwiebeltürmchen steht nicht direkt daneben, oder? Verstehe. Da lugt noch ein kleiner Teil des Daches der anschließenden “schmucklosen” Gebäude zwischen Russischer Kapelle und Hochzeitsturm heraus. Danke für die rasche Rückmeldung! I’ve stayed in Darmstadt for one night; I remember that I would’ve like to see the Art Nouveau buildings, since someone had told me they were really pretty, but alas there was no time. Next time then, your post really makes me wanna go explore the city! For some reason I can’t reply on comments from within my wordpress account anymore… Anyway: I had already written the following reply for you: Go visit Darmstadt! But come in summer. There are so many beautiful parks and a swimming lake in the middle of the city, the Woog. Or you come for the Heinerfest, first weekend in July, biggest Volksfest in Südhessen or the Schlossgrabenfest, a free music festival all over the city center at some point in May, fun time to see the city.